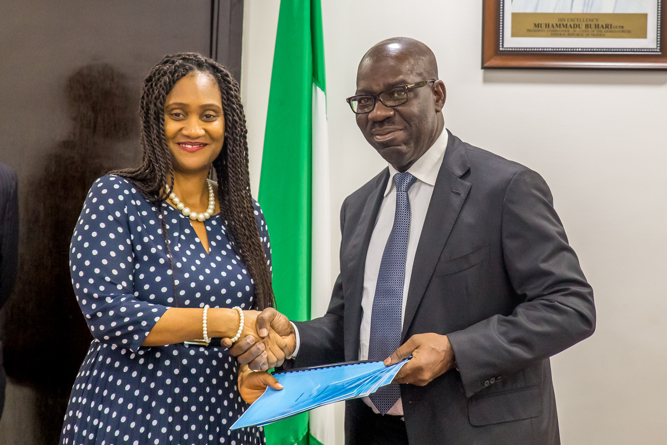 Edo State Governor, Mr. Godwin Obaseki has signed a power purchase agreement noting that the agreement was in furtherance of the previously outlined power plan for the state. Governor Obaseki disclosed this in Benin City on Wednesday, when he appended his signature on Power Purchase Agreement entered into with Ossiomo Power and infrastructure project. This was as he also promised uninterrupted power supply across the state, especially in strategic areas, stressing that Edo State is one of the transmission hubs and home of electricity in Nigeria. He said, “We should be able to deliver 24/7 uninterrupted power to all government establishments located along Sapele Road axis including Government House, Secretariat, Court Complex, Central hospital, House of Assembly and also the Palace”. The governor, who expressed confidence in the quality of services to be delivered by the company, said about 5 megawatts would be used as take-off for the project. Meanwhile, Governor Obaseki also noted that the 5 megawatts would be transmitted on a new 35-kilometre double circuit 33Kva line, which is being constructed from Ologbo to Kings Square. In addition, the MoU would further facilitate the state government’s effort to actualise its vision towards attracting investment to the state. All these factors put Edo in a very competitive advantage to generate electricity. The bane of our development in Nigeria is lack of electricity. Therefore, any city or state that can offer reliable and uninterrupted power supply stands all the chance to get all the benefits accruable because of the availability of power”, he said.